Founded in 2012, My Popcorn Kitchen was born out of a love for cooking (and eating!). We hand-craft our fresh, made-from-scratch gourmet popcorn in over sixty flavors, using the highest quality ingredients. Made in small batches the old-fashioned way. We also like to get creative and whip up specialty flavors featured every month of the year! I highly recommend Aaron at Golden Oak Web Design. 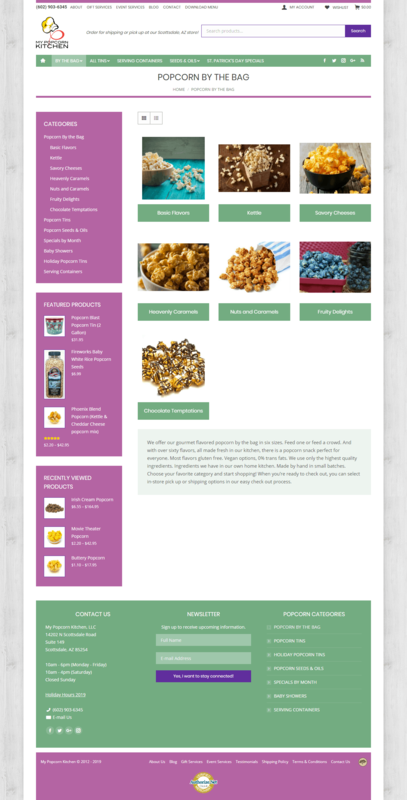 He took the existing poorly designed/implemented My Popcorn Kitchen web site and redesigned both front and back end to create a web site I can be proud of and my customers enjoy using. He is talented, knows his craft, and has the highest degree of integrity. He worked diligently and tirelessly on my project. He also provided training to allow me to be able to make updates to the site and understand the platform. I look forward to working with him for many years to come. Problem: My Popcorn Kitchen offers two separate services (including the products) and this needed to be highlighted on the website. Solution: The two services offered are Corporate Gifts and Special Events. 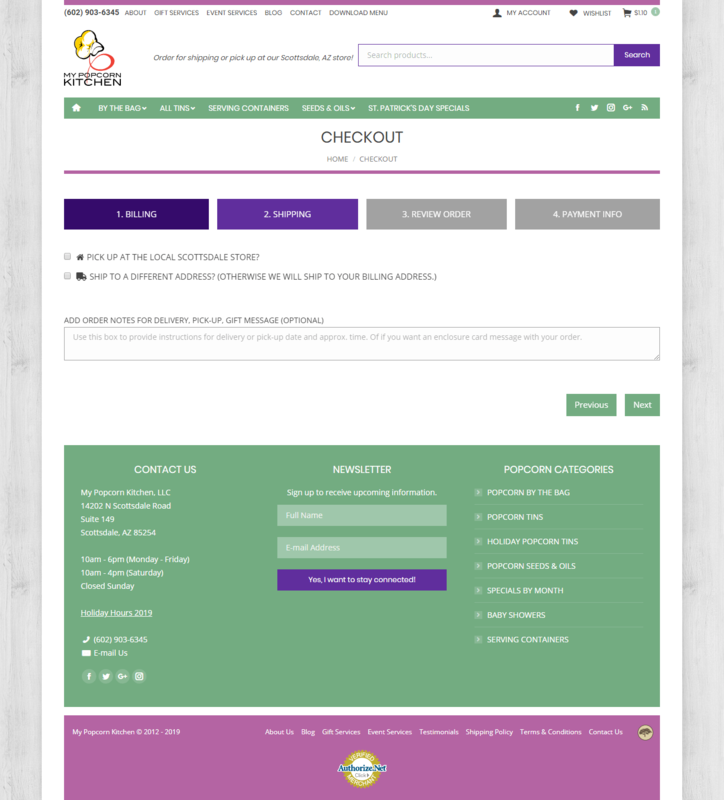 We created a page for each service, which includes within the content: testimonials, gallery images, a portfolio of work, and a lead generation form. These two service pages act as sales funnels and are marketed as such. Problem: My Popcorn Kitchen uses e-mail marketing to send a monthly newsletter to its customers. 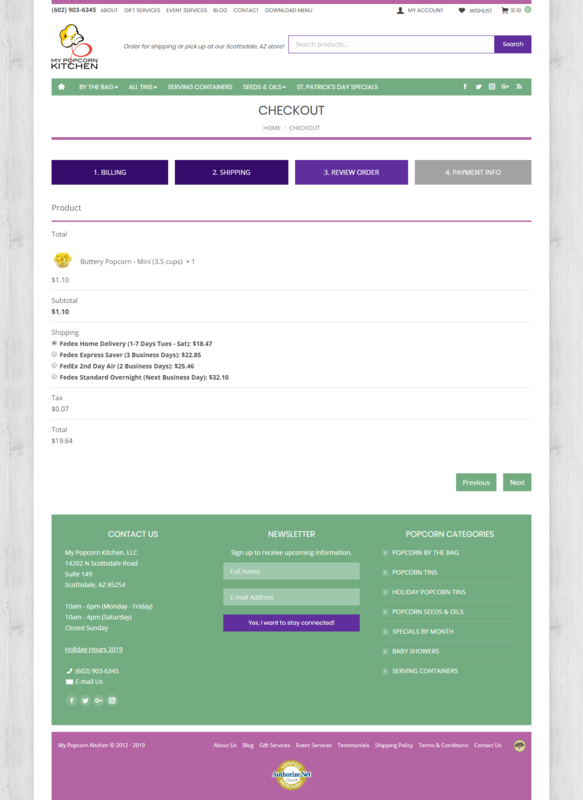 The client needed a way to continue to build the newsletter list. Solution: Because the client already had a popular blog that is frequented by search engine traffic and social media traffic, we installed a modal box popup plugin to the website. The modal box will only show after 60 seconds on a blog or if the blog is scrolled down to a certain point on the page. The plugin is connected to a third-party e-mail marketing service through an API. The popup asks for a name and an e-mail address to receive the newsletter. Problem: The client wanted to use a multi-step checkout system. 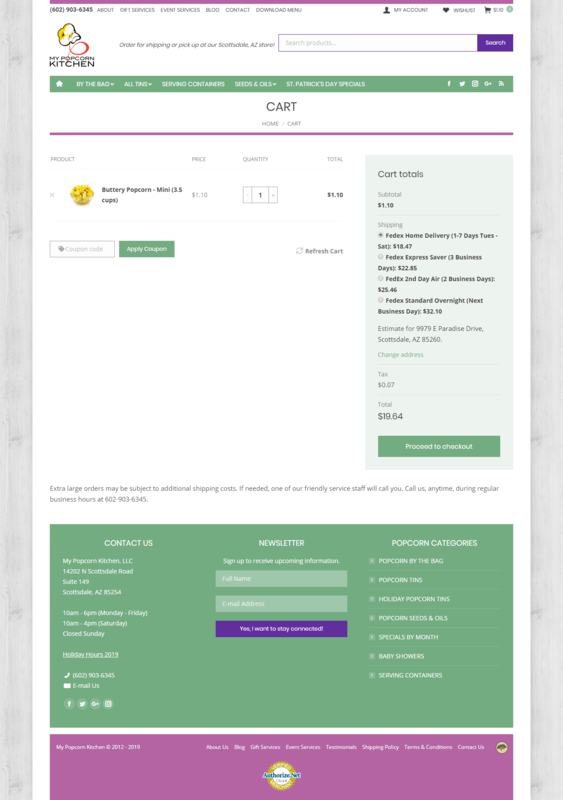 Solution: Most WordPress themes only offer the WooCommerce checkout template as a single page. This can be extended through custom development or by using a third-party plugin. We opted to use a plugin from Code Canyon to reduce development costs for the client. 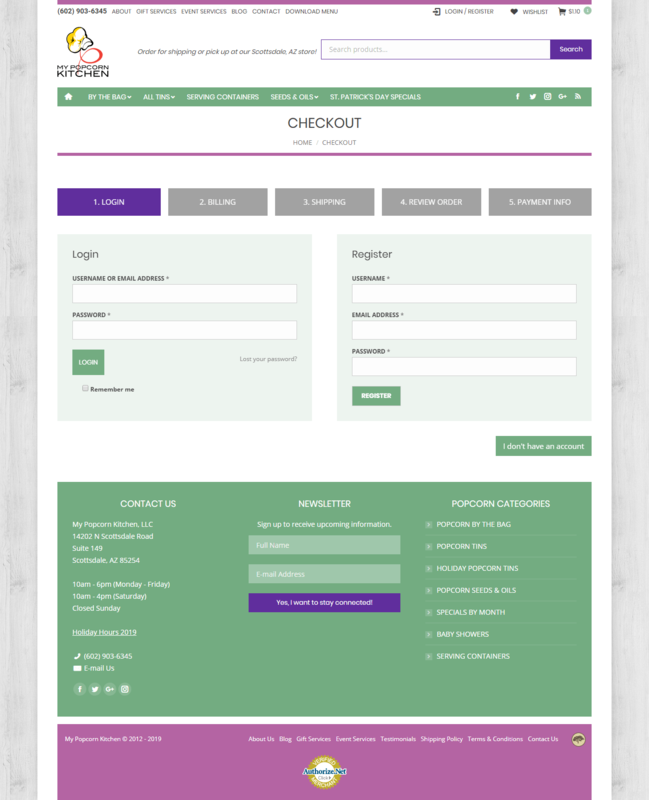 Problem: The client needed a way to offer local pickup at the store during checkout. Solution: We developed a custom plugin for WooCommerce that gives the option in the Shipping section during checkout to choose either “Pick up at the local Scottsdale Store?” or “Ship to a different address? (Otherwise we will ship to your billing address.)”. This choice also reflects in the Payment section and on the invoice.